The western portion of Lake County comprises the North Coast AVA. It encompasses the Clear Lake AVA, which in itself has 168,900 acres of land, the Red Hills Lake County AVA, and High Valley AVA. Within Lake County, a total of 8,530 acres are planted to winegrapes. This is expected to double in the next few years, as many new vineyards are being planted. Cabernet Sauvignon is the most planted variety with 3,300 acres. Sauvignon Blanc is the second with 1,790 acres. Fourteen wineries are located in the region. About 20 out-of-county wineries purchase Lake County grapes from independent growers. Lake County crushed 32,000 tons in 2005, about one percent of California's total winegrape tonnage. 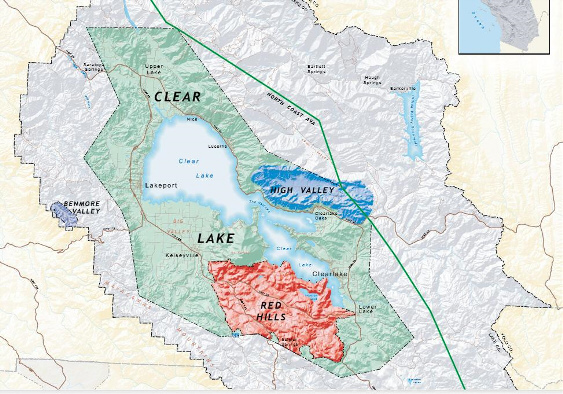 Lake County surrounds Clear Lake, the largest natural lake in California. The vineyards are planted throughout the county, from the agriculturally rich valley at 1,370 feet elevation (lake level), to the rocky red volcanic soil at more than 2,000 feet elevation around Mt. Konocti—a dormant volcano in the Pacific Rim chain. These elevations provide cooler winter conditions and a later start to the growing season. Summer growing conditions are suitably warm to ripen the grapes and the elevation allows rapid cooling in the evening. Few grape pests can tolerate the altitude and cool climate. Lake County growers are committed to sustainable farming and participate in year long educational programs to this end.